The “why does everyone around you die” trope, which sometimes takes the form of “why does everyone I love die,” is pretty musty. “Brothers in Arms” isn’t the first time Arrow has dipped into that well, and it won’t be the last. But what this episode has in spades is something other recent episodes have lacked, give or take a scene or two: a sense of history. When “Brothers in Arms” works — and it often does — it’s because of John Diggle and Oliver Queen. David Ramsey and Stephen Amell take that tired old trope and make it work, because that trail of bodies is one that the founders of Team Arrow have seen, and sometimes made, together. In this episode, two men who consider themselves brothers come to blows, and two actors get a chance to dig pretty damn deep. Director Mark Bunting and credited writers Sarah Tarkoff and Jeane Wong clearly know what they’ve got on their hands here, and so they give the hour something few of its fellows have had this year: breathing room. Arrow’s sixth season has been pretty uneven, with major plot lines bungled and a mid-arc villain switch that threw the whole series off-balance. 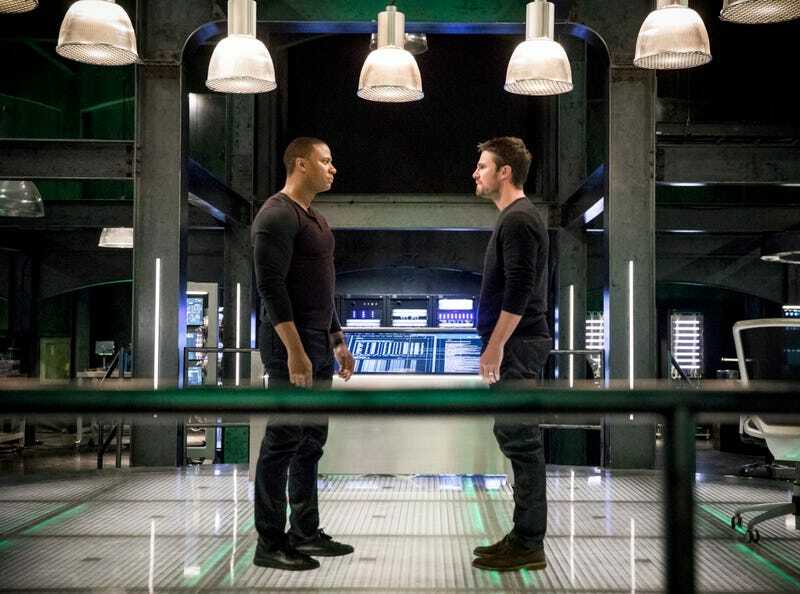 There have been highlights, too, and the season’s finest moment so far has a few things in common with the centerpiece scene in “Brothers in Arms.” First, there’s a sense of stillness as Oliver and Diggle square off. That stillness exists in nearly all their scenes together, actually, but it’s most prevalent in the big one, and not just because it’s then shattered by their brawl. Second, it’s shot in a style that’s thoughtful and, for Arrow, downright calm, and that simplicity and attention to framing acts as a sort of flag for the scene. It tells us that what’s happening is of great importance — a big moment for not just the episode or the season, but the show. And third, it carries with it the show’s history, going back to the very first episode. To be fair, not all of it works, but even the minor stumbles feel oddly honest. Oliver’s jab about Diggle’s brother, like Digg’s line about William, is a really low blow, but it’s also pretty rich coming from a guy who has seen the majority of his family and a pretty high percentage of loved ones die in front of him, often as a result (indirectly or otherwise) of his actions. It feels like the kind of thing one person says to another because he knows exactly how much it will hurt. Amell’s delivery puts the seal on that: while Ramsey lets Diggle’s line-crossing accusation explode out of him, Amell takes his time. That’s a calculation. He chooses to say it, and he does so icily, after a moment of silence. When considered as a part of the show’s history, it may not work, but when you think of it as a purely character-driven moment, as one huge beat in a life-changing argument, it fits perfectly. That’s what’s so great about the main story in “Brothers in Arms”: it all feels like that, like a collection of moments that add up to something that can’t ever be taken back. If (and let’s be honest, it’s more when than if) Diggle and Oliver reunite, this will argument and those punches will always be a part of their story. 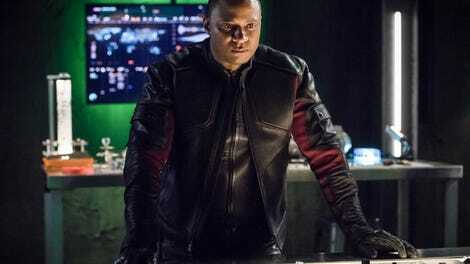 It’s a scene that works because the actors know the people they’re playing so well — Ramsey in particular is terrific, playing the scene as thought Diggle wants to make Oliver understand, rather than simply trying to win an argument — and because the events that lead it up to it so efficiently escalate the tension. It’s easy to play these conflicts as though everyone involved is just hankering for a fight, but here, the writers, as well as Amell and Ramsey, make sure this is a story of two people who are trying really hard to make sure this doesn’t end badly. That it does end badly doesn’t make the struggle less compelling. That big confrontation, as well as those that precede it and the break that follows, are so effective that it’s easy to forget that much of the rest of the episode doesn’t work so well. Curtis speaks like a human being this week, which is a big improvement that allows Echo Kellum to simply be likeable and charming again; his storyline feels a bit flimsy, but frankly any plot for Curtis and Dinah that doesn’t center on the drama of Team Not-Arrow is a welcome change of pace. Whether or not the choice to essentially fast-forward through the “fighting Diaz from inside the Diaz-controlled police department” storyline is a wise one remains to be seen, but it’s a bit jarring to see the show dispense with so much plot in a single hour. That it did the same thing on a much larger scale last week is somewhat less than reassuring. While those threads of the plot aren’t without flaw, they’re total aces compared to the nonsense going on in the Quentin/Not-Laurel/Diaz corner of the Arrow world. Watching Katie Cassidy play “Bad Laurel” is still a pleasure, if only because she seems to be having so much fun, but the whole dynamic feels both played out and more than a little gross. The battle for the soul of Not-Laurel has been going on for so long now without going anywhere that all the reversals are predictable, and the show seems to have completely abandoned even the most meager acknowledgments that Quention shoving a stranger into his dead daughter’s life is deeply messed up. And if we could just declare an outright moratorium on the use of the word “daddy” when it comes to this storyline, that would be terrific. Still, not even Ricardo Diaz purring lines about making daddy proud to Laurel can totally undercut the effectiveness of this episode. If nothing else, the great Diggle-Queen Blowout of 2018 has provided a much-needed jolt of clarity to Arrow. At its heart, this is a show about people who want to help and protect others, and about how often they screw it up. It’s about what it costs them, and how it hurts them, and how it helps them. And it’s about the bonds that tie them together. Arrow did in one scene what it couldn’t do in a whole season’s worth of debates about Oliver’s leadership and the nature of a team: it made the stakes personal, and it showed us two people who just want to do their best and who can’t seem to get it right. Give David Nykl (Anatoly) more to do, please. Glad to see Arrow remembered Lila! Wish they remembered any of the kids. Maybe they’re all just hanging out with Raisa? Felicity mostly just stands around looking uncomfortable in this episode, but the scene in which she dresses both Oliver and John down was terrific. I particularly liked when Emily Bett Rickards sort of bent over to stare John down as she passed him on the stairs. There was one particularly impressive shot in the big final battle, in which we went from Oliver’s fight to John’s in one uninterrupted, cleverly maneuvered take. Nice to see some clear, comprehensible fight stuff after last week’s mess. So, what happens when Diggle’s suddenly with Argus? It seems extremely unlikely to me that Oliver wouldn’t know that the District Attorney’s kid was dying of cancer. But hey, he’s busy.